This topic contains 9 replies, has 1 voice, and was last updated by Spiracle Themes 11 months, 3 weeks ago. I can’t seem to figure out how to make the Home page subheading disappear from my home page even though there is nothing in the customize box for that field. I thought it posted my website since it asks for it in the top fields. But here it is. 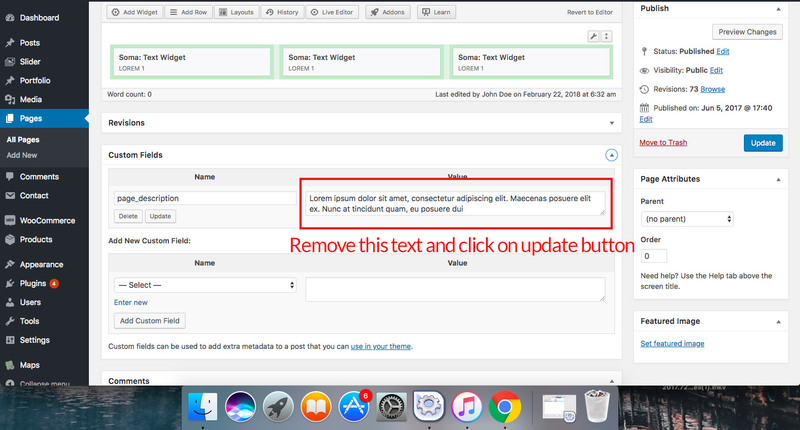 Please try to enter some words in the text field through Appearance -> Customize-> General Settings to check whether its working or not. Do let us know once you do that. Hello, I just added some text to change it and it removed what was there. I’m having another issue on hotelbethel.org. I want the black footer to disappear & just add my own footer as widgets. Could you please explain more briefly ?. I didn’t find any black footer on your website. Yes, I reuploaded the original theme, then just used the original footer. Now I am having issues with getting the sub heading off of each of the pages top sections. That didn’t really help. It can’t get rid of the sub-heading under the page title. View link below. Note : If you cannot see the Custom Fields section then you need to enable it from the Screen Options which is at the top right of the page.